Believe it or not, this dish belongs to the express category. Today feeling exhausted and hungry, and not in the best mood, probably because of a foggy weather (San Francisco weather in the summer), like we say in French, “le ciel me tombe sur la tête“, the sky is falling on my head, which means that everything is so heavy that you have no energy. I am dreaming on a relaxing vacation on a tropical island with white beach, some sun and nothing else. Since that is not possible right now, I decided to bring some sun inside the house, and what better to enlighten your day, than a vibrant and delicious vegetable dish? Of course, being exhausted, I did not envision myself, spending hours cooking and cleaning afterwards. Mentally, it was impossible. So here we go, we have broccoli as the lead actor and a bunch of secondary vegetables that play an important role as well. Never undermined the role of a secondary actor, it changes the whole play. 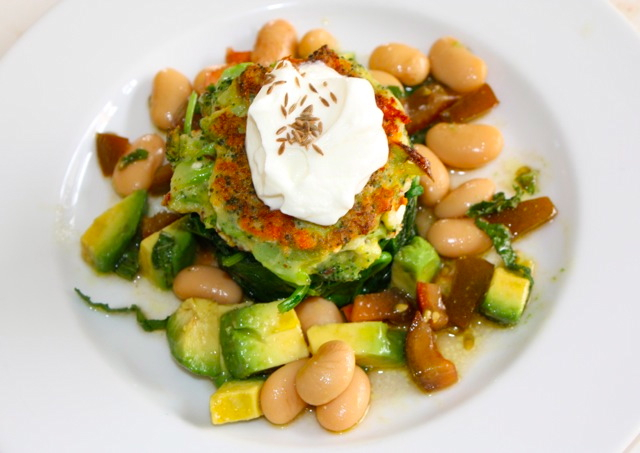 The baby kale saute, is really optional, you could very well serve these galettes with the butter bean salad only. 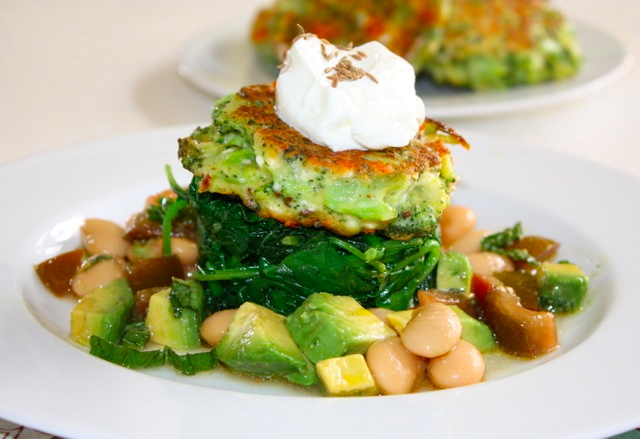 I was in the mood for some kale, and it complement this dish quite well, so I added it. It’s not essential. Bring a large pot of salted water to a boil. 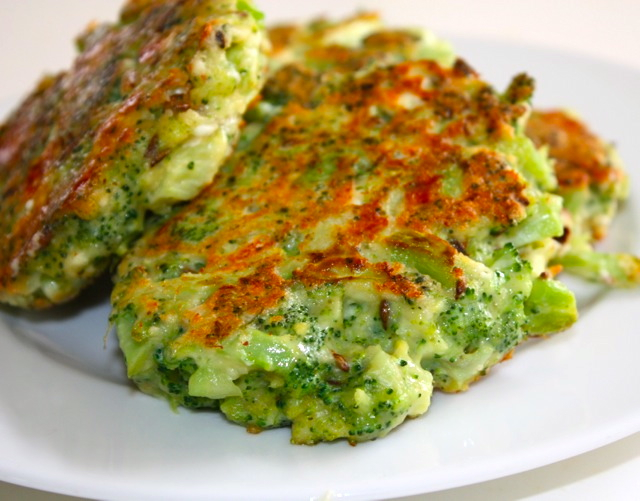 Cook broccoli for about 3 minutes, until lightly cooked and crunchy (if too cooked the broccoli will absorb too much water and the galettes will remain soggy). Drain and chop roughly. In a mixing container, mix broccoli, cumin and flour. Mix well all ingredients. Then add eggs and mix to obtain an homogenous mixture. Add garlic and chili and mix well. At the end, add feta carefully making sure not to break the pieces of feta. You need some unbroken pieces of feta in the galettes. Heat oil in a large pan. Take some mixture (the equivalency of 2 tbs) and form small galettes. Cook on both sides until golden brown and cooked all the way through. Heat olive oil in a large pot, add garlic until fragrant. Add kale and cook at high heat until wilted. Adjust with salt and pepper. Mix all ingredients together, keep chilled. This entry was posted by silvia on August 14, 2014 at 8:21 pm, and is filed under Express - Less than 30 minutes, Vegetables, Vegetarian - dairy. Follow any responses to this post through RSS 2.0.You can leave a response or trackback from your own site.